Standard Language: He's a man who likes his beer vs. He's a man that likes his beer. He's a man who likes his beer. He's a man that likes his beer. He's a man at likes his beer. He's a man as likes his beer. He's a man what likes his beer. He's a man he likes his beer. He's a man likes his beer. Guyanese I told him, in different parts of the continuum, acrolect ("high") to basilect ("low"). [I] = low-high front vowel, such as the vowel in SAE hit. [E] = low-mid front vowel, such as that in SAE bed. 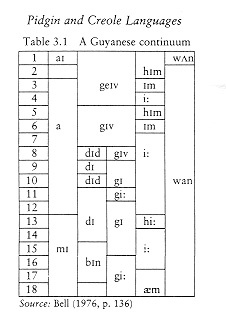 [^] = mid-central vowel, such as that in SAE but. [O] = low back lax rounded vowel ('open o'), such as in SAE boy.